If you are on of those who like a soft and colorful looking window treatment, then a Roman shade or Roman blinds could be just the thing for you. Such blinds go about their function efficiently and also unobtrusively add color and drama to any room. 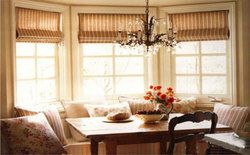 Roman-blinds come in the following types so as to suit homes with differing requirements. Fabric Roman blinds: For those who want the look and benefits of curtains but without the added inconvenience, fabric roman blinds can do the job wonderfully. Such blinds, when pulled up, give a nice and rippling look to your windows. And when these are lowered, you get to enjoy the fantastic patterns and vibrant colors of the fabric that has been used in the fabric roman blinds. Bamboo Roman blinds: These blinds are made from natural wood fibers, bamboo reeds, and grass. The result is a soft woven fabric that folds beautifully and makes for excellent blinds that are a real treat for nature lovers. we are a specialist interior furnishing marketers, specializing in the specification, project management and installation of all types of window treatments. We work with market leading manufacturers of window blinds and curtains. This enables us to provide you with a variety of window treatment options whatever your requirements. We wish to take this opportunity to put forth our exclusive range of window fashion products for venetian, vertical, roller blinds and awnings. suvarna systems provide a professional measure, installation and after sales service. Contact our sales department for samples, literative and technical advice for manual and electric system. we promise to provide our customers with good quality products , project management and installation. Our friendly team of professionals welcomes inquiries for any type of project, no matter how large or small. We pride ourselves on excellent customer service and have a fierce reputation for looking after our clients.